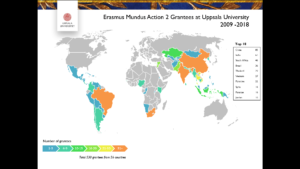 Over the past three days, Uppsala University has hosted concluding sessions for the three Erasmus Mundus projects we have coordinated (INSPIRE, LOTUS+ AND PEACE). As the entire Erasmus Mundus Programme concludes on 14 July this year, participants from four continents have met to sum up the projects and discuss possibilities for future cooperation. Erasmus Mundus Action 2 (EMA2) is an EU-funded scholarship programme that has enabled students and researchers from low- and middle-income countries outside Europe to do an exchange or a whole programme at a university in Europe. Uppsala University has been one of the most active European participants in the programme and has hosted no less than 530 scholarship holders from 56 non-European countries between 2009 and 2018. 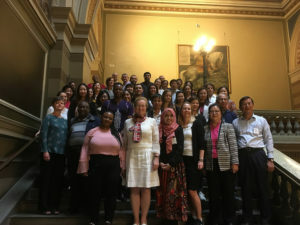 The most common countries of origin have been China, India, South Africa and Brazil, but under the programme, Uppsala University has collaborated with more than 200 higher education institutions in numerous countries, primarily in Asia, Africa, the Middle East and Latin America. The University has distributed scholarship funds from the programme totalling more than SEK 50 million. The majority of the 530 scholarship holders have done exchanges at Bachelor’s, Master’s or doctoral level, but many have come to take a Master’s degree or a PhD or as postdocs or visiting lecturers. Sincere thanks to all the researchers, teachers and department staff at Uppsala University who have helped to make the programme such a great success! This is the English version of Uppsala University’s Vice-Chancellor’s blog where you can find a selection of blog posts by Vice-Chancellor Eva Åkesson and Deputy Vice-Chancellor Anders Malmberg. Subscribe to get notified when new blog posts are published.